How can cities in Louisiana strengthen resilience beyond simply mitigating immediate impacts of tropical storms? 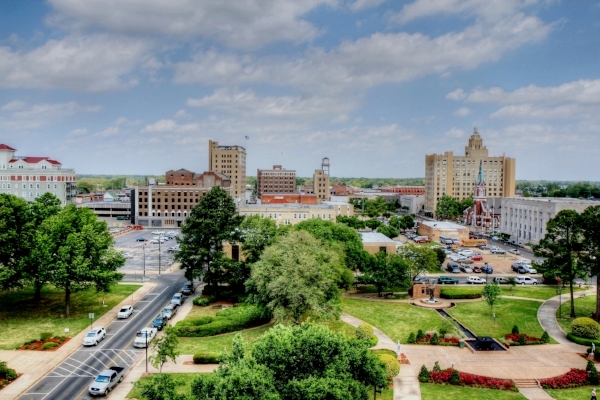 The City of Monroe, on the banks of the Ouachita River in Northeast Louisiana, has experienced a number of changes in the past years that have challenged its resilience. While the city serves as an important hub for northeast Louisiana and surrounding regions, it has suffered economically from the contraction in forest product industries and the closing of the Guide Automotive Plant. The impacts of Hurricane Katrina prompted a growth spurt in Monroe, helping to revitalize its economy and bring further changes to the region. Monroe, LA from the St. Frances parking garage. Photo by finchlake2000 via Flickr. In response to these changes, Monroe adopted a new comprehensive plan in 2008, One City, One Future, which sets the overall policy framework for future development and growth in the city to the year 2020. This Comprehensive Plan addresses future land use, transportation, parks and recreation, and other infrastructure, as well as environmental challenges and opportunities. Through the comprehensive planning process, Monroe identified specific priorities for its future, namely fostering growth in jobs and the local economy, enhancing educational opportunities, and beautifying the city. To ensure the goals of the Comprehensive Plan are realized, and through funding from OCD’s CRPP Program, Monroe commissioned new Comprehensive Zoning Ordinance and Subdivision Regulations. In addition, and in keeping with their history of urban planning, the City of Monroe completed an update to the city’s Comprehensive Master Plan. Finally, the consultants hired to work on the planning documents for Monroe have also produced a report titled “Recommendations for Sustainability & Resiliency in Monroe City Codes and Plans.” This report raises ideas and makes suggestions to help guide the city’s actions moving forward, but in a less political manner, as it is non-binding and did not have to be approved by the City Council. Monroe’s new Comprehensive Zoning Ordinance and Subdivision Regulations help build resilience by clarifying requirements and regulations, incorporating concerns of environmental risk, and promoting economic development and community stability. Monroe’s new zoning documents address environmental concerns at different scales in two main ways: by valuing natural sites and environmental systems, and by responding to environmental hazards. Planned Unit Developments prioritize environmentally sensitive design, preservation of natural features, and functional and beneficial uses of open space. Corridor design standards encourage reducing provision of redundant parking to minimize surface runoff. Pervious surface cover is encouraged where feasible. New or expanded off-street parking facilities, with 25 or more spaces, must filter or store the first inch of rainwater during each rain events, through use of pervious paving, rain gardens, bioswales, detention areas, constructed wetlands, or other methods approved by the City Engineer. Wind risks to mobile homes are minimized by requiring specific ground anchor methods and number and types of tie-downs. The main focus of Monroe’s new Zoning Ordinance and Subdivision Regulations follows those of its Comprehensive Plan: to promote economic development and stable communities. These new documents present land use and design regulations to help achieve these goals. Specifically, several of the special use districts help focus on multiple, and complementary benefits, thereby fostering strong neighborhoods. The Riverfront District special use district is established to promote revitalization and investment in the area by cultivating the unique characteristics of the area. Open Space Recreation Districts are established to provide important connections between residential neighborhoods and public amenities through a range of recreational options and specific commercial activities. Monroe’s new ordinances ensure adequate and appropriate provision of infrastructure, given a range of contexts and needs. To ensure that adequate infrastructure is constructed for a new subdivision, before beginning construction, the developer is required to provide a financial commitment, such as through a certified check or performance bond, which could cover the total construction costs of all required infrastructure improvements. This guarantees that the new infrastructure will be completed as required. If it is not, the city has the right to draw on those funds to finish construction. Stormwater Management Requirements of the Subdivision Regulations not only prohibit adverse downstream drainage or flooding impacts, but also require that all on-site retention and detention systems be based on a 25-year storm event. To efficiently allocate infrastructure resources, the zoning ordinance allows for shared parking facilities. Specifically, off-street parking spaces for separate uses may be provided collectively for two or more uses with different hours of operation in order for each use to meet its minimum off-street requirement. The immediate next steps for Monroe are two-fold. First, the new Zoning Ordinances and Subdivision Regulations shall be adopted and implemented. Second, the findings from the consultants’ report “Recommendations for Sustainability & Resiliency in Monroe City Codes and Plans” should be incorporated into the city’s planning documents and process. In addition, the local government staff of Monroe will complete a training session with the consultants, to inform them about the new regulations as well as how to better integrate hazards concerns and into local planning.